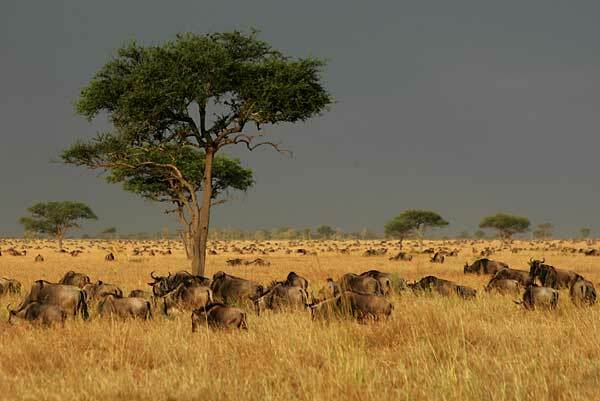 Location: Serengeti National Park is the oldest and most popular game reserve in Tanzania, famous for the annual wildebeest migration. The park, covering a vast 15,000 sq km (5,790 sq miles), stretches north to Kenya and border Lake Victoria to the west. Even when the migration is quiet, the Serengeti offers arguably the most scintillating game-viewing in Africa with great herds of buffalo, smaller groups of elephant and giraffe, and thousands upon thousands of eland, topi, kongoni, impala and Grant’s gazelle. Accommodation in Serengeti ranges from exclusive luxury safari lodges to the more affordable and popular Seronera Wildlife Lodge in the middle of the park. There are also campsites in Serengeti but facilities at these are extremely basic.